The fact that Lizo Taliwe doesn’t have a car doesn’t mean he can’t take care of his woman. 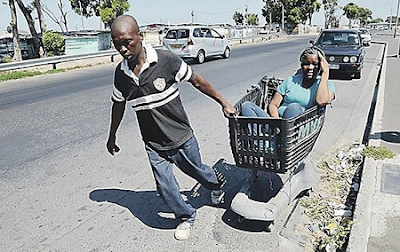 The unemployed 42-year-old from Never Never squatter camp in Philippi, Cape Town, pushes his girlfriend in a shopping trolley wherever they go! “She is my queen and it’s my job to take care of her in any way,” he told Daily Sun. When the People’s Paper recently caught up with the two they were on their way to Never Never from Samora Machel. “I enjoy what I’m doing and I don’t mind the hot weather. As long as my queen is happy, I’m happy too,” he said. His girlfriend Zukiswa Dyantyi (40) said she was happy she chose to be with Lizo because he treats her like the queen she is. The two have been together for eight years. They said they didn’t understand why couples abuse each other. “When I see a man beating a woman my blood boils. I don’t understand why they need to do that to someone who can’t fight back,” said Lizo. Zukiswa said she felt sorry for women being abused by their partners because they miss out on being loved. When the SunTeam asked her if Lizo pushed her because she was lazy, he jumped to her defence. “She is not lazy. I love her and I don’t want her to get tired. Even though we are poor and don’t have anything, we love each other.